The fort, all 16 million bricks of it, is the third largest fort that defends a coast ever built in the U.S. It’s also the largest masonry structure in the country. The fort actually is unfinished. It took 30 years to build, with work ending in 1875 when everyone left and the fort was abandoned officially. It may be a fort, but it never actually saw any battles and was never engaged in any military activity (although it did house prisoners during the Civil War). 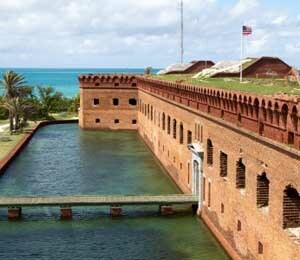 Even though it’s the largest building in the Dry Tortugas, the fort isn’t located on the largest key in the chain. Garden Key (the site of Ft Jefferson) actually is the second-largest key; smaller only than Loggerhead Key, and only by 110,000 square meters (yes, the Dry Tortugas’ keys are so small, they’re measured in meters, not miles….). The fort’s walls are eight feet thick and 45 feet tall. The fort’s barracks – which were destroyed in a fire in 1912 – were constructed to accommodate 1,000 and were more than 300 yards long. The fort was used primarily as a prison. Some of its more famous prisoners include Dr. Samuel Mudd, Samuel Arnold, Michael O’Laughlen, and Edmund Spangler, who were convicted in the conspiracy to assassinate President Lincoln. The fort had 520 heavy guns (never used, of course), and were considered at the time to be among the most advanced weapons available. As you tour the fort, you’ll see red and yellow bricks. The yellow bricks were placed there before the Civil War and come from Pensacola, Florida. The red bricks came to the island during the war and come from Maine. Keep a sharp eye out for the name of J.N.O. Nolan, a master bricklayer who etched his name into several bricks throughout the fort.